If only all estate agents took this much care with their properties. I actually despair at the way we sell houses here, home staging is the last thing on any seller’s mind when it really ought to be the first. So while I don’t haunt the UK real estate sites much, I do spend a fair bit of time trawling the Scandinavian ones for the pure joy of the way they get it so right. This turn of the century apartment in Gothenburg hit me right between the eyes. With the right balance of period features and contemporary design, its most striking feature is a monochrome kitchen with black mosaic tiling. In fact, let’s start there shall we? Warm wooden open shelving creates a homely feel against high gloss white units. © Jonas Berg. A minimalist monochrome kitchen with room for a small table to entertain and prepare food. © Jonas Berg. Classic Thonet coffee house chairs in contemporary black lend themselves to the period of the building, referencing the black mosaic splashback. I’ve yet to see a monochrome kitchen done better, particularly in a modest space. Absolutely drenched in light, the white walls highlight the beautiful stuccoed ceilings and tiled fireplace. New parquet flooring brings an element of warmth to the apartment while lofty ceilings give a feeling of grandeur, typical of buildings of its era. I love the touches of terracotta and saffron yellow throughout. Carefully chosen pieces of art add personality and interest, combining natural woven textures in the large living room rug with tactile ceramic vases and abstract art. Black and white collections on display bring out the spice in the linen cushions. © Jonas Berg. An inspiring space to work with leafy views of the neighbourhood. Photo © Jonas Berg. Intricate details where cornice meets tiling. A beautiful focal point to sit and admire. © Jonas Berg. I adore the original Swedish fireplace, although this one isn’t functioning, it’s pieces of historical interest like this that give this home real character. A clutter-free bedroom with only the essentials feels open and airy with tall windows looking out onto trees and the contrast as seen in the kitchen is echoed on the bed with dark blue, grey and spice linens and throws. I’m completely in love with his apartment. It doesn’t shout or work too hard to show off the character and the quality of light is key in making this property feel spacious. What do you think? Layered dark linen and cotton in contrasting waffle textures and stripes add depth to a tonal bedroom. © Jonas Berg. 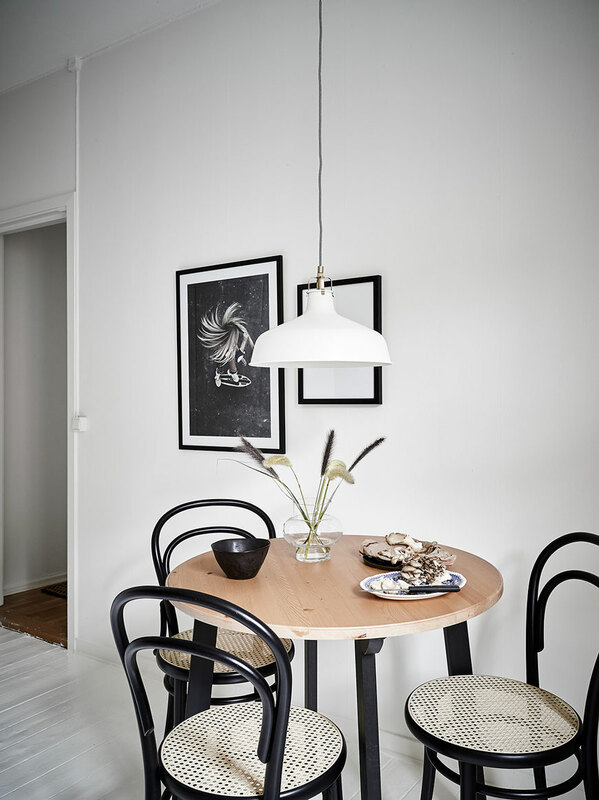 Photography © Jonas Berg for Stadshem.